PayPal new telephone security measures by "lexis nexis" are stupid! The call centre folks in the UK have as one of their security questions: "Do you know any of these people?" Then they read out a bunch of names and ask you to say who you know! I'm sorry but how does PayPal new security partner lexis nexus think they know the people I know! I have never provided any additional names to them or PayPal. On what basis are they building up their database of related people and just cause there's a logical relationship am I required to know everyones names I'm connected to? Are we expected to remember all our neighbours who in most cities don't socialise much. All our long distant cousins? Our past colleagues from enterprise companies with tens of thousands of staff! What if I say I know all the people in their security question list, are they going to reject me telling me I have not heard of some random name. The new associated name verification system was dreamt up by idiots. Yann Arthus-Bertrand spent three years collecting real-life stories from 2,000 women and men in 60 countries. Working with a dedicated team of translators, journalists and cameramen, Yann captures deeply personal and emotional accounts of topics that unite us all; struggles with poverty, war, homophobia, and the future of our planet mixed with moments of love and happiness. GradGreenhouse is a new dedicated online graduate recruitment platform. Listen to the mix on this! Yves "Jetman" Rossy flying in tandem with skydiver Vince Reffet using custom-built jetpack spiral, dive and climb through the skies of Dubai in a stunning 4K video. Thank you Albert Einstein for your mind. Thank you Leonardo da Vinci for your innovation. Thank you Yves Rossy for your exhilarating adventure in our time. These are some of the people who've inspired me in life. 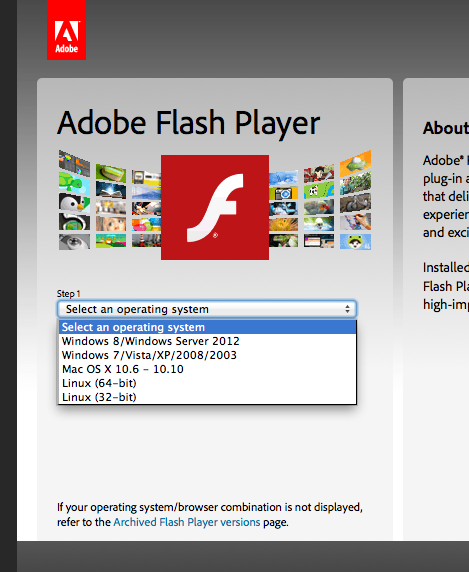 Adobe your flash install experience has been crap for the last 2 versions. The mac installer doesn't work and we need the updates to avoid the zero day malware exploits that are happening now. So for the benefit of others like me who couldn't update their flash player, here's a better way to do it. Then select your OS and version and download a standalone installer. Adobe, you should not stop supporting Flash Player, currently used on 1.3 billion computers! HTML5 isn't as wonderful as we were all lead to believe. Well done Matt. Slightly jealous I stopped running CreateWork.com the freelance community I started back in 1998.